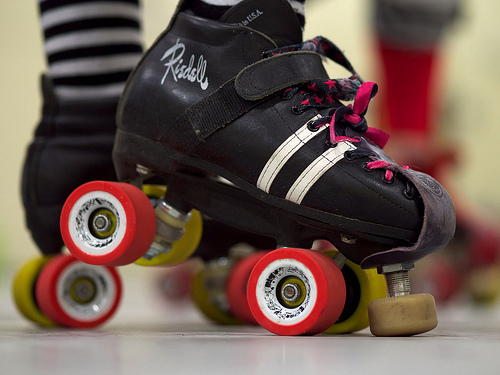 Sports Costs > How Much Do Roller Skates Cost? How Much Do Roller Skates Cost? Roller skates are typically designed with four wheels equally spaced apart. These skates are commonly found at roller skating rinks. Skates.com provides a wide range of roller skates for beginners and advanced skaters, from roller skates for kids that cost $29.99 to an interceptor speed skate that costs $749. Most roller skates, however, are going to be between the $30 and $150 price range. For instance, the popular Chicago Girl’s Adjustable Skates on Amazon retail for $29 to $40. Rollerskates.com offers a range of roller skates for different age groups and models for indoor and outdoor skating. Here, classic roller skates cost $29.99, while a pair of top-end Derby/Speed skate package for serious skaters cost $629.99. At RollerSkateNation.com, Derby skates cost from $109.99 to $729. Skate package prices range from $194.99 to $289.99. According to a roller skates buying guide, speed skates cost from $25 to over $1,000. At popular retailers, such as Walmart and Target, the costs can be in the $25 to $50 range. The quality of a pair of roller skates improves as the price increases. Higher end models will be made from stronger and more durable, but lighter materials and will be equipped with superior quality bearings and wheels, which typically give skaters a faster and smoother riding experience. Roller skates are available in high-top and low-cut models, which are made from various materials. Leather has always been considered the best material, but there are modern boots that are created from a type of microfiber material that may be more resilient than leather but may cost more. Skates come with a single-action or a double-action truck. A roller skate truck refers to the part of the skate that holds the wheels, similar to the axle for the wheels of a car. A single-action truck comes with a single cushion positioned at a 45-degree angle. Double-action trucks have two cushions placed at a 10-degree angle. Skates with single-action trucks are usually closer to the floor, while skates with double-action trucks are more responsive and enable faster turns. A lot of roller skate trucks are manufactured from aluminum alloy, fiberglass or nylon. Trucks constructed from metal are normally stronger and lighter and cost more, which is why there are usually found on higher-end roller skates. Roller skate wheels come in two forms: the wide speed-type wheel and the narrow, artistic-type wheel. Oftentimes, speed-type wheels provide more stability and traction and usually work best when doing corners at high speed. Roller skates with artistic wheels are normally quick to respond. Bearings are significant components that influence the speed of the roller skates and are rated by the ABEC (Anti-Friction Bearing Manufacturers Association) system 1-9. Usually, the higher the ABEC rating, the faster the roller skates. Some roller skates do not include the protective gear. Many manufacturers sell protection packages, which often include wrist guards as well as knee and elbow pads. A typical starter gear costs around $40, while a more sophisticated set can cost up to $150. The set may include a helmet with moisture-wicking abilities and slide-on wrist braces, in addition to the elbow and knee pads. If you want to go roller skating at a local rink, plan on spending $3 to $5 per skate session. If you use your skates on a regular basis, you will need to replace the wheels and brake pad every year or so. This depends on whether you are skating indoor or outdoor. Roller skates are often bought along with protective gear, wheels and bearings. Protective gear includes wrist guards, knee pads and elbow pads with sizes that fit children and adults. The roller skates should have adequate ankle support coupled with laces that go from the top of the foot to the top of the boot. Roller skates will also have a round brake on the front to aid in stopping. Roller skates are usually designed for regular use unless specified. Many manufacturers void the warranty when the skates are subjected to jumps, tricks and stunts. Casual users will find roller skates with soft boots more appropriate. These skates are designed for comfortable skating but can provide overall support. Hard boots are designed to be durable and are usually suitable for beginners who are rough with their skates. Intermediate and professional skaters will find Roller-Derby skates perfect for their abilities. Designed for all contact sports as well, these models are durable and fast yet comfortable. Just like children outgrow shoes, they will outgrow their skates over time. With that being said, highly consider an adjustable skate for growth. In general, it’s best to buy a size one size bigger than what your child is used to wearing. When buying roller skates for kids, it may be practical to consider getting adjustable skates to accommodate growing feet. This is a better option compared to getting a new pair of skates every time the child outgrows them. Do comparison shopping for various models before making a purchase decision. Check for coupon codes and free shipping offers on minimum orders. Find retailers that offer skate deals for products and items that are being discontinued or updated. Many of the stocks offered may be limited in sizes and options.